Twieled il-Mosta. Studja l-Università ta’ Malta fejn iggradwa bħala accountant. Il-passatemp ewlieni tiegħu huwa l-fotografija, u fil-fatt huwa membru tal-Malta Photographic Society. Huwa wkoll dilettant tal-festi, u jieħu ħsieb sit elettroniku dwar il-Mosta b’enfasi speċjali fuq festi u ċelebrazzjonijiet. Jikteb regolarment f’pubblikazzjonijiet tal-festa. Dawn l-aħħar seba’ snin, Mark Micallef intefa’ b’ruħu u ġismu fuq proġett ambizzjuż li bih qed jiddokumenta fotografikament il-festi kollha li huma ċċelebrati f’Malta u Għawdex. Born in Mosta. Studied at the Universityof Maltawhere he graduated as an accountant. 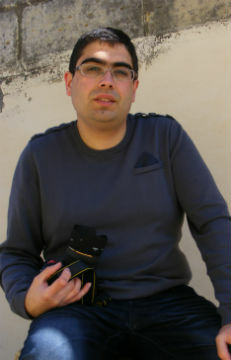 His preferred hobby is photography, and is a member of the MaltaPhotographic Society. He is keenly interested in all aspects of Maltese festa celebrations, and directs a website about his home town, with special emphasis on feasts and celebrations. He is also a regular contributor on festa publications. Over the past seven years Mark Micallef has embarked on the present ambitious project of photographically documenting all festa celebrations across Maltaand Gozo.